The end user is given the ability to submit custom maps with their written comments. Be it enacted by the Senate and House of Representatives of the United States of America in Congress assembled that the purposes of the National Environmental Policy Act of 1969 are: To declare a national policy which will encourage productive and enjoyable harmony between man and his environment; to promote efforts which will prevent or eliminate damage to the environment and biosphere and stimulate the health and welfare of man; to enrich the understanding of the ecological systems and natural resources important to the Nation; and to establish a Council on Environmental Quality. As the Bureau of Land Management (BLM) embarks on a new era of land use planning, it needs to leverage information technology (IT), especially the World Wide Web, to create more efficient business practices and encourage an open and collaborative process. To address this need while addressing the requirements of the National Environmental Policy Act of 1969 (NEPA), BLM has launched the E-Gov for Planning and NEPA project. Partnering with Esri, BLM recently completed a pilot project to build core land management tools for the BLM enterprise. The project is being conducted by the Planning, Assessment, and Community Support Group in the BLM Washington, D.C., office; from the BLM National Science and Technology Center in Denver, Colorado; and from the BLM Alaska state office in Anchorage. E-Gov for Planning and NEPA, or ePlanning, is a project initiative that focuses on the delivery of planning information consisting of fully integrated text with intelligent and interactive maps and map layers. ePlanning creates tools and technology so that planning teams can simply create these integrated documents as BLM does. 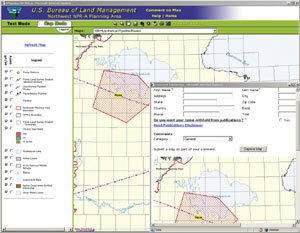 Some related goals are to provide a common look, feel, and functionality for BLM planning and NEPA documents through enterprise solutions; a new and efficient method for public participation and collaboration in the planning process; a consistent and supported technology implementation across BLM; common and reproducible work flow processes; reusable data for processing postplanning actions; and the transition of land use planning from a project to a process. ePlanning establishes a new mechanism for land use planning that allows for an openly participative, collaborative, and community-based land use planning system. Users can add additional map layers to the map in ArcIMS by clicking on the "Add layer" button. The BLM pilot site has an additional 300 map layers stored in the IMS. The new way of planning provided by the ePlanning toolbox is facilitated by dynamic, Web-based documents that enable users within the BLM, as well as the public, to read land use plans, submit comments, and view maps related to these plans. Interactive documents link specific sections of text to specific features on maps. They allow users to click on map features to connect where on the landscape specific document text is relevant. ePlanning allows the public to submit online comments on planning documents. Geography is central to planning, and ePlanning makes geographic data available to anyone with a computer and an Internet connection. The tools developed for the ePlanning system are based upon two Esri technologies: ArcIMS and ArcSDE. Working with a team from Esri Professional Services, BLM is now in its second year of the project and recently completed and launched a pilot project demonstrating the ePlanning tools and integrated document concept (www.ak.blm.gov/nwnpra). The pilot land use plan chosen to showcase this new site is the Northwest National Petroleum ReserveAlaska Integrated Activity Plan/Environmental Impact Statement (EIS). 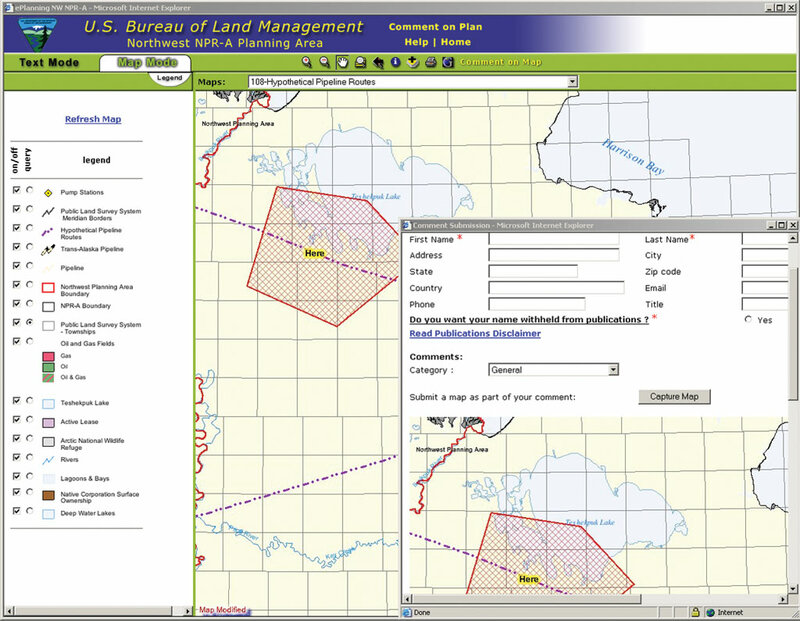 The pilot site features a text area for reading the planning documents, a map mode for viewing associated spatial data, and comment submission tools. The planning team in Alaska is currently using the comment analysis tools developed by Esri as part of this project to sort, track, and prepare responses to public comments received on the draft of the plan/EIS. All other tools will be completed between fall 2003 and fall 2004. Esri consultants will design, build, test, and transfer the ePlanning modules to the ePlanning system; BLM employees of many disciplines will use these ePlanning system tools as an interface for developing a dynamic and interactive land use plan. The long-term goal of this project is to extend the one-stop portal concept into other federal agencies. Meeting this goal will require more federal partners and the publishing of planning documents on a Web site. BLM is currently focusing on transitioning the ePlanning pilot project to an enterprise solution. Other long-term goals of this project include increasing the use of the Internet for building and publishing planning and NEPA documents, collaborating with constituents, increasing partnerships with other land management agencies, and modernizing data management to support interactive digital publication while maintaining traditional paper output. By bringing land use planning and NEPA into the digital medium, ePlanning fulfills a critical component of President Bush's management agenda by fostering government-to-government and government-to-citizen data and services interchange, consistent with the e-government initiative. This approach should change the way BLM uses GIS in support of land use planning. The Bureau of Land Management, an agency within the U.S. Department of the Interior, administers 261 million acres of America's public lands, located primarily in 12 western states. For more information, contact Carl Zulick, ePlanning project manager, BLM Planning, Assessment, and Community Support Group (tel. : 202-452-5158, e-mail: Carl_Zulick@blm.gov, pilot project Web: www.ak.blm.gov/nwnpra), or Boykin Witherspoon, Esri project manager (tel. : 909-793-2853, ext. 1-1799; e-mail: bwitherspoon@esri.com).